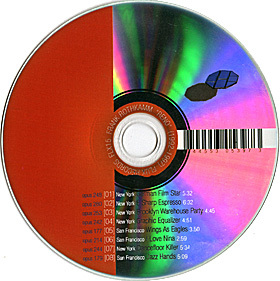 Frank's return to the scene at the very end of 2011 is with a ballet masquerading as jazzy tech house music that he started to compose 20 years ago. Frank wouldn't be frank however if RENO would not have it's conceptual raison d'etre: LE BALLET SURMODERNE (the supermodern ballet). He is clearly not thinking here about the ballet with its origins in the Italian Renaissance courts of the 15th century. Instead, RENO's origins are based in the last decade of the 20th century, the time of the 2nd psychedelic revolution: the Rave movement in San Francisco. There he organized Raves and Rave-type happenings with go-go dancers from nightclubs. There, while performing in drag, he met his future wife and eternal muse Nina. But it was not until he arrived in New York that the idea of electronic dance music as a form of avant-garde composition - a ballet music independent of the club scene - was born. The music he now composed was for a utopian ballet surmoderne in which the separation between dancer and spectator no longer exist, where every movement of everything is in equal relation to every other movement and in time with the rational clock of the universe. The clock is the ever-present bass drum ticking away at frequencies that the body can feel. The ballet's primary perception and experience is physical, expressing a dancing paradox: Every bar is different, but only minimally so; RENO is repetitive music, but there is really no repetition. With these ideas in his head he went out all over New York to find the support. Alas, Frank continued to live as a skinny lad, under great stress and in poverty in New York. He was unable to sign any kind of album deal or have an opportunity to stage his ballet music. In 1998 he moved to Los Angeles. RENO was left unpublished, a torso without head or limbs. Until Now. RENO was scored in CUBASE on an ATARI ST computer, hooked-up to an orchestra of what today would be considered vintage synthesizers, samplers and drum machines, most of which share the reputation of being hard to program. This can now be considered a l'esprit de vie that runs through all of Frank's work. Not surprisingly, the drama of RENO as the invisible ballet surmoderne unfolds with a different style and soundset for each track. Because this dance music definitely has meat on its bones it's commonly referred to as BEEFY HOUSE. Feels like a joke I don’t quite “get”. The tracks run without commitment, cuddling lovers of the genre with all the recurring cliches. A smattering of retro jewels! We also don`t need to waste much time thinking about the coherence of an artist`s output; they should be free to betray their own routes without necessarily `explaining` a single work. The CD is therefore inevitably defective. It’s simplicity is deceiving of course – this IS Rothkamm – but it’s simply not my cup of tea. Another hot tip for a floppy piece of jewelry! A very fine release - very slick house/techno music - produced excellently.